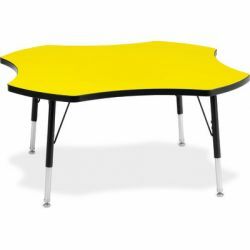 Scratch-resistant laminate, E-Z to clean tabletops. 1 1/8" thick tabletops. Moisture-resistant edgebanding thermo-fused to tabletops means no cracks for germs to hide. Stronger than T-molding, edgebanding is especially beneficial at corners that take the most abuse. Custom tables available. Extra-safe dual-screw leg adjustability system prevents loose and misplaced screws. Legs adjust in one-inch increments and accommodate infants to adults. Lower section is adjustable chrome-plated. 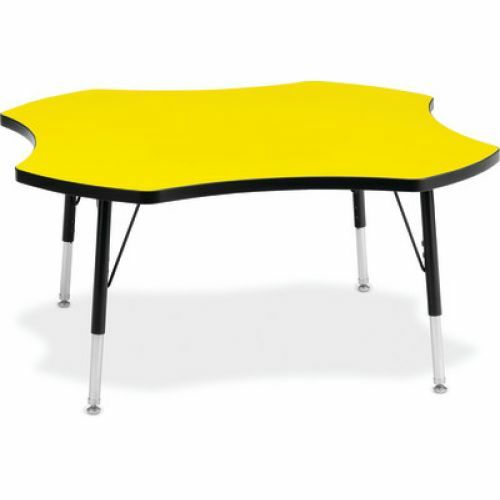 Legs are quickly and easily secured to tabletops by mounting into attached predrilled brackets Nylon-based swivel glides prevent carpet snags and rust and keep tables level.